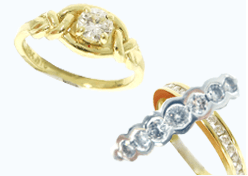 14K gold is the optimum choice these days when it comes to purchasing high quality jewelry. It can be found frequently in mid to high-end pieces. It has become the most popular grade of gold in today's era of high gold prices, with higher grades such as 18K gold becoming far less common as a result. 14K gold jewelry looks great and you will notice the step up from 10K instantly. If you want your jewelry to look great and still come at a reasonable price, go for 14K every time! Here you will find a selection of 14K gold jewelry that can now best be described as extinct â€“ or at best dormant. These pieces were simply too heavy and contained too much pure gold to remain in production at today's gold prices, and have since been overtaken by lower grade merchandise such as 10K gold jewelry and sterling silver. In this section you will find some of the most extravagant 14K gold creations from the TraxNYC Custom Jewelry collection. 14K gold jewelry looks about as good as you can get these days while still keeping within a realistic budget. 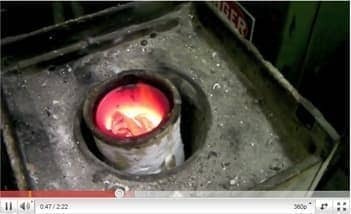 For this reason it is the perfect metal to use in many pieces. As a result 14K gold features heavily in many of our Custom Jewelry projects. 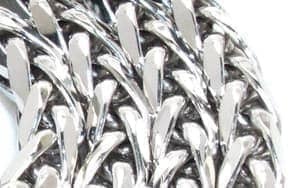 People try to get the high-end 14K gold look for less by buying colored stainless steel pieces such as Cubans and Francos, but these alternatives can only fool the most uninformed of gold chain enthusiasts. The look and especially the feel of a solid 14K gold chain is something you have to experience for yourself to understand, and we assure you that no imitation can ever hope to come close. All gold that is used in jewelry is an alloy of gold and at least one other metal. This is because pure gold is too soft for everyday wear, so it is alloyed with a mixture of metals such as silver, copper, nickel and zinc to give it strength and durability. 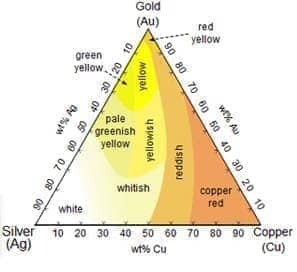 14K gold is composed of 14/24 or 58.33% gold and 41.66% other metals. This combination of pure gold and color-appropriate alloys like copper is what gives 14K gold jewelry its high quality look and feel. Other commonly used alloys include silver, which gives the metal a faint green hue. Solid 14K gold, due to its relatively high gold content, can be affected by certain chemicals like chlorine, commonly found in cleaning products. 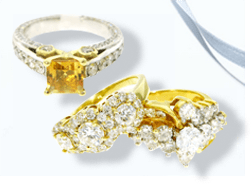 To clean gold jewelry you should never use chemical-based cleaning products â€“ warm water and a natural, detergent-free soap will do just fine. 14K gold jewelry will always be one of the most popular choices out there, regardless of gold prices or any other such factors; it just looks so good! And besides, with prices like they are at TraxNYC you will feel like the price of gold is as low as it has ever been. We have a near-endless collection of fantastic 14K gold jewelry here at Trax. A most conventional and eternally stylish example from our collection of Mens Gold Rings is our Yellow Gold Strip Frosted Ring. This Mens Gold Ring is made from top quality 14K yellow gold which gives it its signature look. With a price tag of just $350 this one is a real steal! 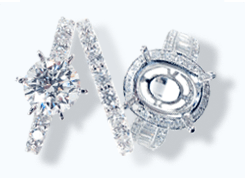 The quality of gold jewelry available here at TraxNYC is sure to surpass even your wildest expectations. Check out our wide and affordable selection of 14K Gold Jewelry today and pick up a piece of jewelry whose value and style will last forever.